Because it's the start of the school summer holidays, Big Chief I-SPY has a special update for all you children out there. 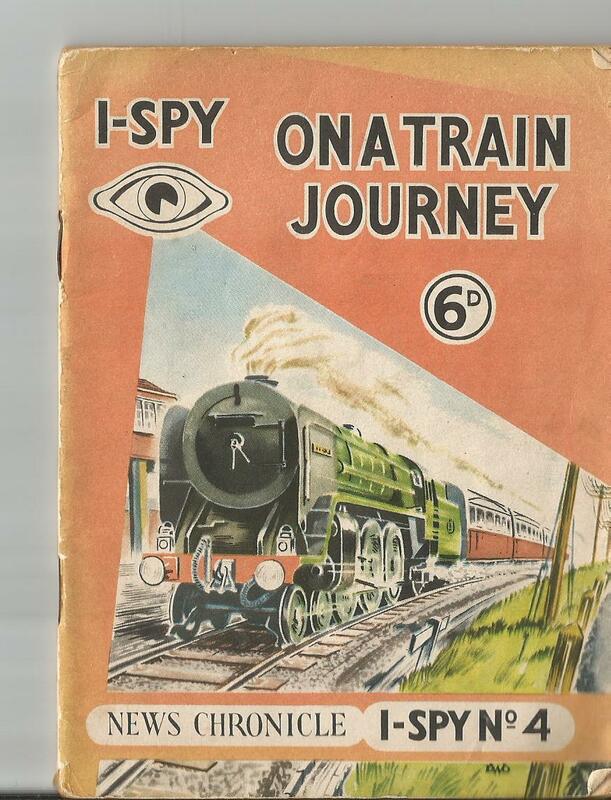 If you've been criss-crossing the capital filling in the I-SPY Book of Tube Journeys, there are now exciting extra new things to see for extra points. Why not go out travelling and see if you can spy them all? 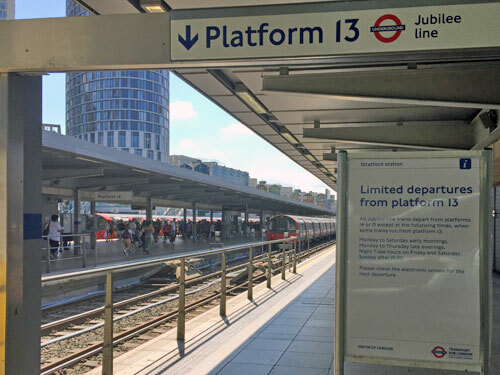 Do you remember how awful catching a Jubilee line train from Stratford used to be? The next train might be leaving from platform 13, 14 or 15, and to discover which you had to squint at a tiny display, and maybe run down the platform to cram into the first carriage, and then if you missed it you might have to trek across to a completely different non-adjacent platform. How terrible that was. But now they have solved it. Earlier this month they stopped trains terminating in platform 13. Now they only arrive or depart from 14 or 15, which is good because these two are next to each other. Now you always go to the same place, and it is much easier to tell which train is leaving next. Hurrah. They have done this by stepping back drivers so they are always at the right end to drive the next train out. But there are still some times when platform 13 is used because it is not so busy. These are a) early mornings b) late evenings c) Night Tube d) Sundays after 7pm. Ask Mummy or Daddy to let you get up early, or stay up late, and see if you can can spot a train on Platform 13. ▢ I-SPYed a train on Stratford platform 13 and scored 10 Points. Buckhurst Hill is a London Underground station which is not underground and also not in London. There are steps to get in and out via the footbridge, which is no fun with a pushchair and impossible with a wheelchair. But now the station is step-free and hurrah everyone can use it. There are two step-free entrances, one at the far end of each platform. These were actual entrances until 1982, with steps, but then they closed them off because fare dodging is an evil sin. Now there are ramps which connect to the subway which runs underneath the railway. One ramp leads to one side of the subway and the other ramp leads to the other side. 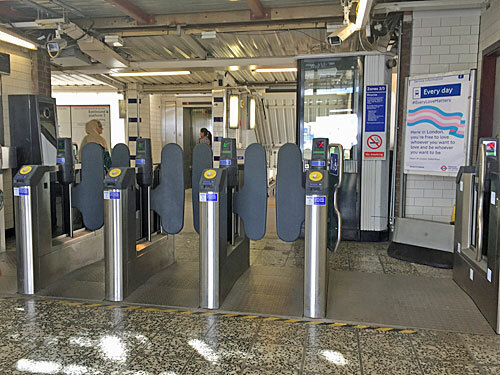 Each entrance has an Oyster reader but no ticket gate, so anyone can now sneak in and out of the station without paying, but that is bad and you must not do it. If you are in the main ticket hall there is no sign telling you where the step-free entrance is. Instead there is a sign telling you to ask a member of staff if you want to know where it is. But when Big Chief I-SPY visited the station all the gates were open and there was no member of staff to ask so you could not tell. So how do you get to the step-free entrance? You have to exit the station past the bus stop and then turn left onto Victoria Road and go all the way down as far as Waitrose and then turn left again down the dead end past The Railway pub and suddenly there is the entrance to the eastbound platform and that is the first sign you will have seen. But if you want the westbound platform you will have to go through the underpass... except you can't do that in a wheelchair because there are slalom barriers to stop cyclists whizzing down the slope, and what you should have done when you left the station was turn right and then right again and then right again as far as the shopping arcade and look for the unsigned alleyway between the laundrette and the cafe and there is the ramp you want. It is hard work. Even if you do manage to get onto the platform you then need a boarding ramp to get up onto the train. And the only person with access to the boarding ramp is the member of staff, and remember there might not actually be a member of staff, so you are stuffed. It is a right farce to be honest, very much the cut-price solution. But technically it is a step-free station, so hurrah for the Mayor's crusade which now totals 74 step-free stations. 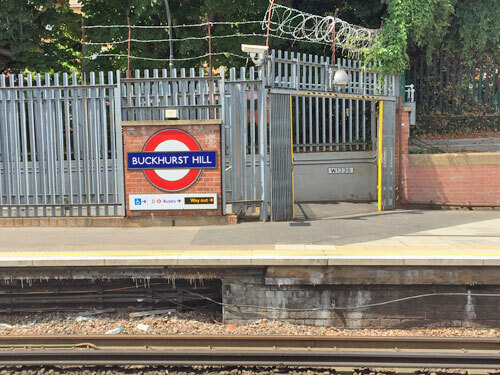 ▢ I-SPYed the step-free entrance to Buckhurst Hill station and scored 25 Points. ▢ I successfully used the step-free entrance in a wheelchair and scored 125 Points. 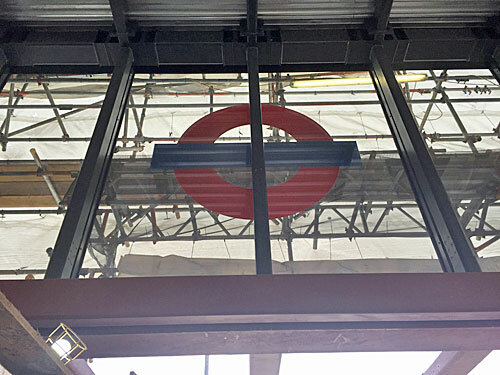 There is a secret roundel at Bromley-by-Bow. Have you seen it? No, you have not seen it, because it is secret. But if you look up above your head in the ticket hall you may see it. You will not see it from the outside because the new glass lantern roof is covered with sheeting. But from inside you can look up and there it is and it is not so secret any more. Of course when the sheeting comes down it will not be secret at all, just big and shiny, so you get more points for spying it now than you will get later. ▢ I-SPYed the secret roundel at Bromley-by-Bow station and scored 15 Points. While you are here you should also look out for the new ticket gates. 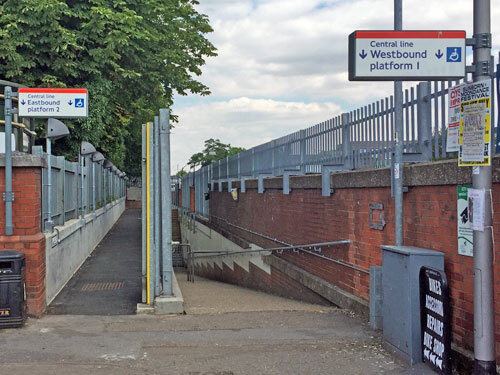 There have been no ticket gates at Bromley-by-Bow for the last two years, because they got in the way of upgrade work, and people had to use separate card readers instead. Lots of people walked through without paying because walking through without paying was easy, especially when you could do it for two years. But now there are proper gates and they have finally been switched on. But when there is no member of staff in the ticket hall, which is most of the time, the big gates are still left open so you can just walk through like you used to because nothing changes. ▢ I-SPYed a member of staff at Bromley-by-Bow station and scored 150 Points. ▢ I fare-dodged at Bromley-by-Bow station and saved another £1.50. Crossrail is coming and there will be lots and lots more points to collect in our Winter update. But for now why not go and see a bench? 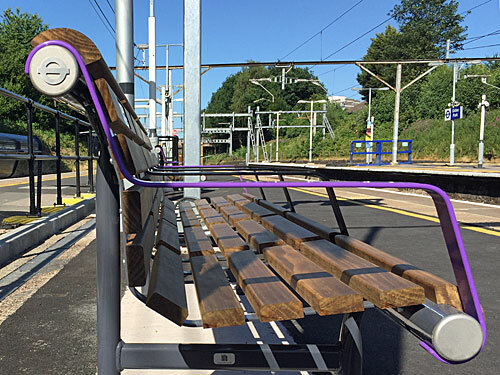 Crossrail stations in the open air are getting special benches with purple bars. These are exactly the same as normal outdoor benches on tube platforms, except they have purple bars instead of yellow or whatever the normal colour is. Lovely lovely purple. You can see the new purple bars at Gidea Park and Goodmayes and Ilford, but they are not yet at all the stations on the Shenfield line so look carefully. ▢ I-SPYed a purple Crossrail bench on a Crossrail platform and scored 20 Points. It is Pride month and TfL is celebrating by making some roundels Pride roundels. These are like normal roundels, but in wibbly wobbly colours like a rainbow unicorn. When TfL were working out where to put their Pride roundels obviously they thought Tottenham Court Road, Vauxhall and Shoreditch High Street, because that's where all the rainbow unicorns hang out. 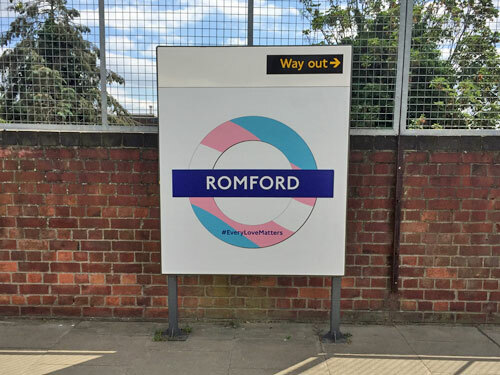 But they also picked Romford, because why shouldn't the people of Romford be reminded that non-heteronormative sexualities exist? Not many people use the London Overground platform at Romford. But if you do ever set off on a backwater safari to Emerson Park or Upminster you will find three roundels here. One is unchanged, one is rainbowy, and the third is trans-inspired. There has not been a trans-inspired roundel before. It is pink, blue and white like the trans flag and it reminds us that when you grow up you do not have to be the gender you were born, indeed what actually is gender anyway, you can just be yourself. Perhaps Mummy and/or Daddy and/or Mummy and/or Mummy and/or Daddy and/or Daddy will be able to explain more. ▢ I-SPYed the trans roundel at Romford station and scored 30 Points. 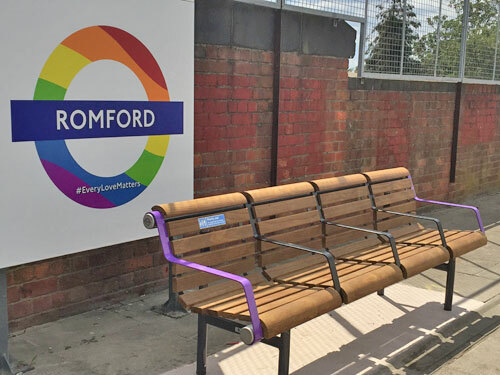 While you are up the platform admiring the rainbow roundel you may also spot a purple Crossrail bench in front of it, which is ridiculous because this is an Overground platform not a Crossrail platform. TfL's branding team are usually a lot more careful about design issues like this, so have lots of points for spying this non-compliant seating colour, and that's probably your entire book finished. ▢ I-SPYed a purple Crossrail bench on a London Overground platform and scored 300 Points.